If you are passionate about quilt making, then you probably already have a cutting mat, ruler and rotary cutter. What you may not have is a protective quilter's bag to keep them all safe and sound. As a beginner I learned the hard way. My cutting mat, ruler and rotary cutter one lived on my sewing table. This meant that within a few months my ruler was badly scratched making it difficult to accurately measure and cut with. My rotary cutter blade soon had an annoying nick on the blade and within a few more months my cutting mat was badly warped from sunlight shining onto the table. An expensive mistake, but one you can now avoid. Good quilt makers know that their tools need to be looked after which is why I have designed this quilter's bag. 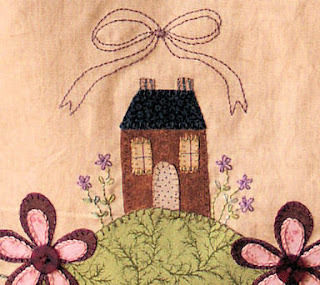 It features two decorative front pockets decorated with simple hand embroidery and fusible applique. 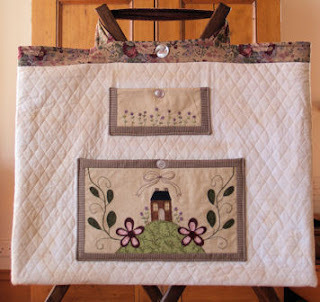 The main body of the quilter's bag has been constructed from pre-quilted fabric, so this project is quick and easy to make. The long straps means that you can pop this quilter's bag over your shoulder and head off to your next workshop or quilters gathering with ease. 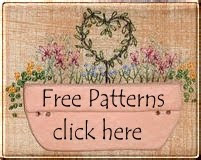 If you would like more information about this pattern, head on over to the Stitching Cow website. I am guilty of leaving my mat, ruler and rotary blade out and about. They dont stay on my dining room table (which doubles as my craft area) but they do get swept into draws randomly as I clear away. I must spend 5 minutes at the beginning of each project from this dis-organisation. I'm inspired by your creation.